Not everyone can handle having beer for breakfast, but for those who enjoy a creamy breakfast stout, the Brooklyn Brew Shop has something for you. 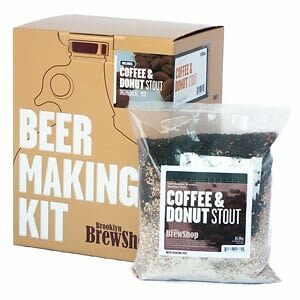 The Brewshop now sells a Coffee & Donut Stout Beer Making Kit. The dark roasted brew is best with the additional flavor of coffee beans with coconut flakes and brown sugar, creating the ultimate espresso-beer. The Beer Making Kit costs $40, and comes with a 1 gallon glass fermenter, an airlock, tubing, a thermometer, a tubing clamp, a packet of sanitizer, a stopper, and a blowoff attachment. The ingredients of the mix include malted barley blend, hops, and yeast. Coffee, coconut flakes, and brown sugar are optional, and recommended, but not included in the set. Looks like its time to start drinking beer with breakfast! Click HERE to check out the other flavors and to buy!